Is your clothing attractive to him? You probably think I’m going to give fashion advice, but you would be incorrect. I’m certainly no fashionista! The kind of “clothing” I’m talking about is not material. It’s our attitude, character and behavior. The Bible has a lot to say about how we “clothe” ourselves in that regard! Colossians 3:18 tells us what we should put on every morning: “Therefore, as God’s chosen people, holy and dearly loved, clothe yourselves with compassion, kindness, humility, gentleness and patience.” Wow! Think about how attractive you would be to your husband (and your children, and your friends, and your mother-in-law and your co-workers) if you were to put on these qualities every morning as you start your day. Think about it. How would your marriage be changed if you decided to be gentle and humble and kind and compassionate toward your husband? I bet he would truly look forward to coming home to you each night! Even if you need to broach tough subjects with your husband, he will be much more likely to listen if you clothe yourself with humility and gentleness and compassion. Try it. Humility…compassion…gentleness…kindness. 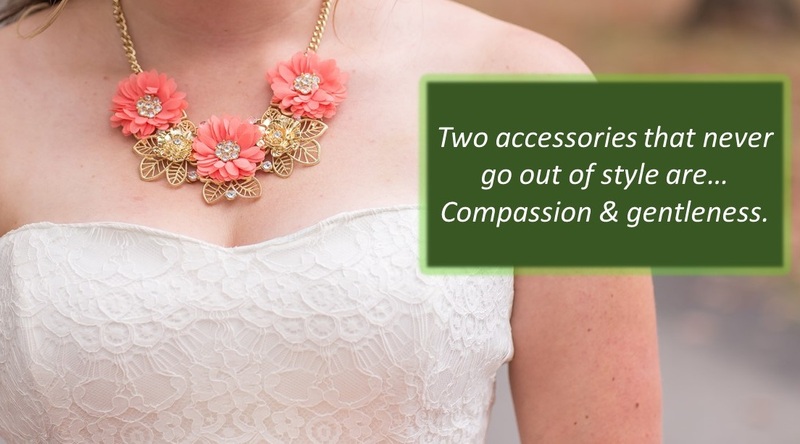 These are fashion accessories that never go out of style!